Is it reasonable to place an immediate provisional prosthesis in the posterior area? An 80 year-old, non-smoking man. The patient has received treatment for hypertension and does not report any allergies. He has been referred by his practitioner for tooth 46 to be replaced by an implant. 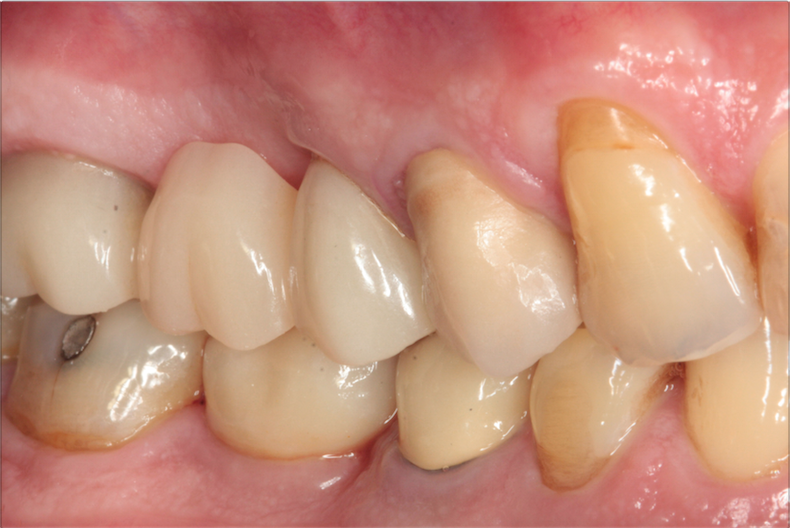 The tooth was extracted 6 months earlier because of secondary tooth decay under a defective prosthetic restoration. The clinical and radiographic examination shows that an implant-borne restoration on tooth 46 is possible (Fig. 1). There is a 9mm mesio-distal space and an 11mm inter-arcade height. The mesio-distal space allows us to plan for the placement of a large diameter implant and the prosthetic space for a cemented prosthesis. Fig. 1: Initial panoramic radiography showing the extraction site of 46 with a alveolar bone undergoing remodelling. 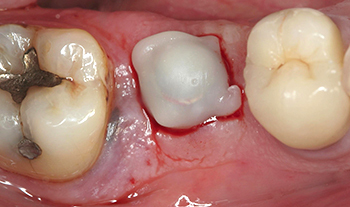 Considering the width of the crestal bone and the importance of the keratinized gingiva, we have chosen the flapless technique. This is a blind technique which requires a certain amount of experience, but which allows for less postoperative monitoring and better healing. Moreover, it is a faster and less traumatic technique for an elderly person that also limits the intraoperative bleeding. We conducted a prospective study to evaluate the immediate loading of 6mm implants in the molar region. The results were better preservation of crestal bone level at one year with a high survival rate at 5 years. This case study took part in the study. Fig. 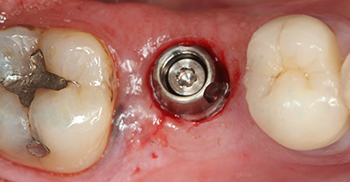 2a and 2b: Occlusal view of the final abutment and the healing cap directly after implant placement (Nobel Speedy 6x13) with the flapless technique. 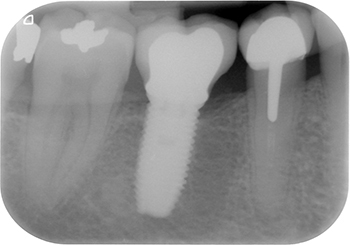 Considering the good primary stability of the implant, immediate temporisation is performed. 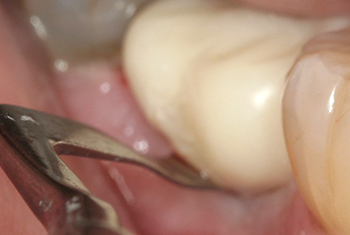 A provisional crown made of unpolymerized composite is adjusted in the mouth and is then polymerized. (Fig. 3). Fig. 3: A provisional crown made of unpolymerized composite (Protemp, 3M) adjusted in the mouth and then polymerized. (Fig. 3). The provisional crown is then placed and relined on the previously designed coping (Fig. 4). Fig. 4: Occlusal view of the pre-made coping on the Snappy abutment. After polymerization, the provisional crown and its coping are removed. 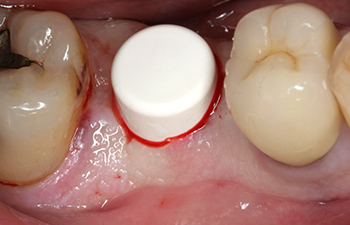 The gaps between the provisional crown and the coping are filled with a flowable composite, while creating a concave and non-compressive emergence profile around the coronal surface. The provisional crown is carefully polished and perforated on the lingual side to guide and control the draining of excess cement (Fig. 5 and 6). Fig. 5: The provisional crown, carefully polished and perforated on the lingual side for the draining of excess sealing cement. Fig. 6: Occlusal view of the provisional crown with a smaller table than the adjacent teeth. The crown is designed with a static and dynamic underbite. Strict instructions are given to the patient to avoid chewing on that tooth for a period of 6 weeks. 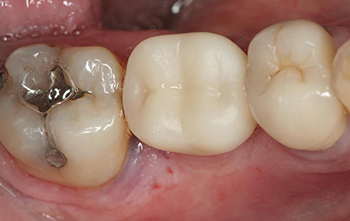 The cement-retained single crown is designed 3 months later (Fig. 7). Fig. 7: Vestibular view on placement of the metal-ceramic crown in good harmony with the mucosal tissues. Control visits are scheduled at 3 months, 6 months and annually thereafter. During each visit, a clinical examination and reproducible retroalveolar X-ray are performed. 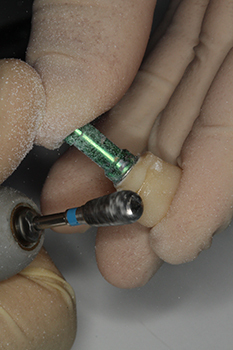 To ensure standardization of the X-rays, a silicone impression with a Rinn film holder is performed on the day of implant placement (Fig. 8 to 10). Fig. 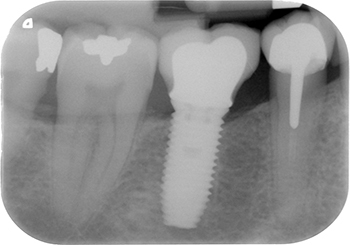 8: Implant check-up at 3 years post-operation showing good stability of the soft tissue. Fig. 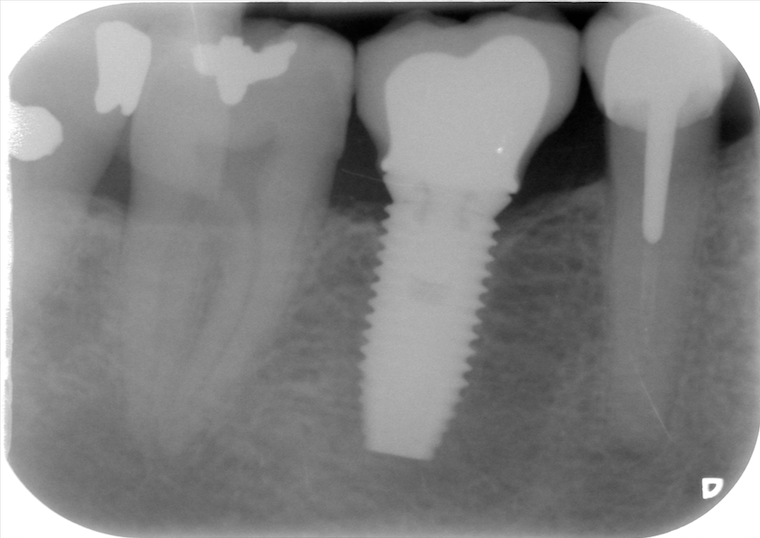 9: Retroalveolar X-ray of the implant and the provisional on first day. Fig. 10a and 10c: Standardised retroalveolar X-rays with the crown in place at 1, 2 and 3 years. Note the bone level stability and the absence of cratering around the implant neck. This patient is part of a group of 48 patients on whom large diameter implants (6mm) were placed with immediate temporisation in the posterior area. We noted very good predictability on all these patients after a follow-up period of 1 to 5 years. With these 6mm diameter implants, the ensuing natural platform switching seems to preserve the crestal bone and improve soft tissue preservation. In addition, primary stability is increased by the diameter of the implant and its conicity. We also know that these implants, with a larger osseointegration surface, seem to tolerate occlusal stress better. Furthermore, studies have shown that early but controlled implant loading seems to be beneficial for the osseointegration process and could even accelerate it compared with a delayed loading. The immediate temporisation in the posterior areas would be of more interest when it is associated with immediate loading, which could prevent the patient from going through a stage of tooth loss or having to wear a removable prosthesis, even if only temporarily. 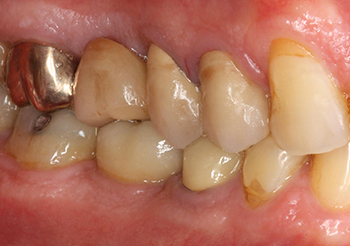 A clinical case of extraction implantation and immediate temporisation will be the topic of a future newsletter. Graves SL, Jansen CE, Siddiqui AA, Beaty KD. Wide diameter implants: indications, considerations and preliminary results over a two-year period. Aust Prosthodont J 1994; 8: 31-37. Mordenfeld MH, Johansson A, Hedin M, Billstrom C, Fyrberg KA. A retrospective clinical study of wide-diameter implants used in posterior edentulous areas. 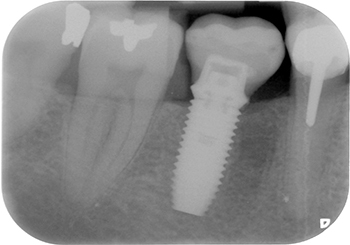 Int J Oral Maxillofac Implants 2004; 19: 387-392. Calandriello R, Tomatis M. Immediate occlusal loading of single lower molars using Branemark System(R) Wide Platform TiUnite implants: a 5-year follow-up report of a prospective clinical multicenter study. Clin Implant Dent Relat Res 2011; 13: 311-318. Antoun H, Cherfane P, Sojod B, A case series of wide diameter implants (6mm) immediatly loaded with posterior single restorations (in press).